Over the past few decades, the number of female scientists and managers working in agricultural research has increased significantly in both industrialized and developing countries, although empirical studies have repeatedly shown a disproportionately low number of women working in senior scientific positions (Sheridan 1998). The science world appears to be greatly affected with gender barriers disadvantaging female scientists in their career development. Throughout the world, female scientists are subjected to more stereotyping and associated negative biases in the work place than their male colleagues; they are less well connected to informal social and professional networks, ultimately leading to lower publication rates; and the cultural stereotypes of men’s and women’s roles within the household still appear to limit women’s opportunities for advancement into senior positions. For this reason, the integration of women into research agencies, which have traditionally been largely staffed by men, poses challenges for those women who want to build a scientific career, as well as for their employers who are responding to demographic shifts (Sheridan 1998 and Brush et al. 1995). 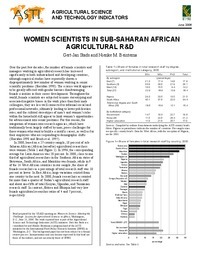 In 2000, based on a 27-country sample, 18 percent of sub-Saharan African (African hereafter) agricultural researchers were women (Table 1 and Figure 1). In 1996, the corresponding average for Latin America was 20 percent. In 2000, close to one third of agricultural researchers in the Southern African states of Botswana, South Africa, and Mauritius was female, while in 9 of the 14 West African countries in our sample, the share of female researchers as a percentage of total research staff was 10 percent or lower. In East Africa, large variations existed from one country to the next. In 2000, female researchers accounted for more than a quarter of Sudan’s agricultural research staff and about one-fifth of total Kenyan, Ugandan, and Tanzanian research staff. In contrast, Eritrea and Ethiopia had very low female agricultural researcher ratios of 4 and 7 percent, respectively.